COOKSBURG, Pa. – In May 1962, Secretary of the Interior Stewart Udall established the National Natural Landmarks (NNL) program to encourage and support voluntary conservation of sites showcasing significant examples of America’s geological and biological heritage. This program differs from public lands agencies like the National Park Service (NPS) or the U.S. Forest Service by recognizing noteworthy private and state-owned properties as well as federal lands, but it shares their mission to protect important natural places and strengthen the public’s appreciation for and conservation of our nation’s natural heritage. In July 1967, the NPS, which manages the NNL system, evaluated Cook Forest State Park for potential addition to the program. That December, 50 years ago this month, the NPS added the section of the park now known as the Forest Cathedral to its elite list of landmarks. The tract encompasses approximately 332 acres, surrounded by an additional 7,000 acres of State Park property. This is one of the largest stands of primeval eastern white pine and eastern hemlock in Pennsylvania. It contains trees over 300 years old with many exceeding three feet in diameter and 200 feet in height. The forest floor has rather limited vegetation due to the dense canopy created by the vast forest. A few open areas allow continued succession of forest growth. In 1956 a severe storm cut a swath of about four acres through the site causing widespread damage. This area has offered an opportunity for researchers to study succession in virgin growth after a natural catastrophe. Cook Forest, located within Cook Forest State Park, is a relic of the forest type that once covered northern Pennsylvania. The forest is predominately comprised of Eastern white pine along with Eastern hemlocks and mixed hardwood tree species. Thanks in part to the protections provided by the NNL program and the Pennsylvania State Parks system, the Forest Cathedral exists today much as it did in 1967, and each year, it attracts tens of thousands of visitors intrigued by the rare natural beauty of this special space. Eight trails of varying length and difficulty run through the Cathedral area, which lies at the heart of the park, including portions of the long-distance Baker Trail and North Country National Scenic Trail. Because of the unique nature of the dense canopy, light is heavily filtered by the time it reaches ground level here, creating a dimmed atmosphere and little plant growth on the forest floor. 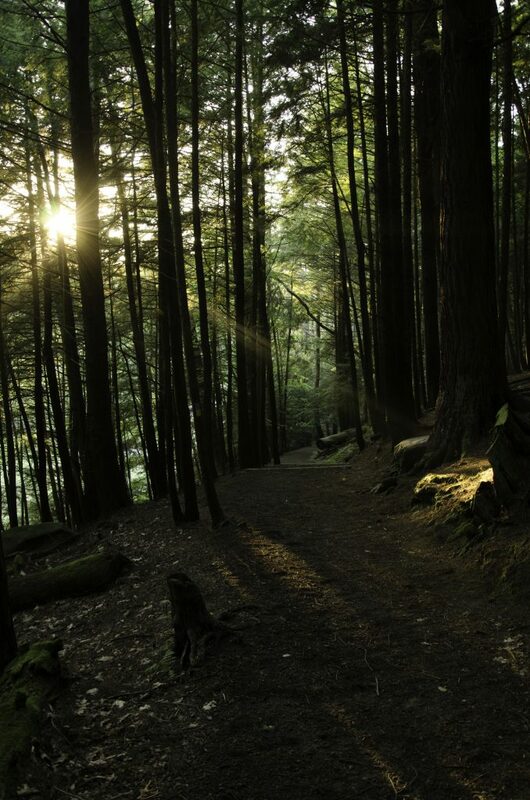 Hikers who traverse these trails often speak of the quiet, reverent nature of the forest and the wonder, awe, and humility they feel as they walk at the feet of some of the tallest trees in the northeastern United States, some of which date back to the 1600s. Cook Forest State Park staff host a number of events in the Forest Cathedral each year, including the popular Cathedral by Candlelight program in the fall, a multi-day Living History event across Memorial Day weekend, a French and Indian War Encampment reenactment weekend in June, guided and illuminated snowshoe and cross-country ski programs in the winter, and regular skills programs on wilderness survival, fire building, food preparation, and more. Find information to plan your trip to Cook Forest State Park online at VisitPAGO.com or call 814-849-5197. View Topographic Map of Cook Forest State Park.